In 2015, remembering the First World War in Germany has been quite reduced – and it is unlikely to change up to 2018. Nevertheless, it is good to see that there are still some events to remember the pivotal war that took millions of lives one hundred years ago. 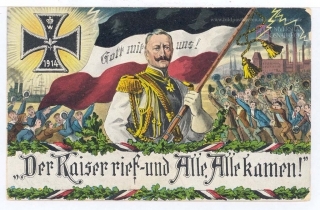 On 12 February 2016, “Der Kaiser rief – und Alle Alle kamen” (the Emperor has called – and Really Everybody came) will be presented at Erich Maria Remarque-Friedenszentrum (Erich Maria Remarque Peace Centre) in Osnabrück, a mashup based on texts, images and sound sources. The performance combines literature and documents with personal notes of veterans, ranging from extracts of novels and poems to entries in diaries and friendship books. High school students from Gymnasium in der Wüste read from e.g. Peter Englund’s Schönheit und Schrecken, Paul Coelestin Ettighoffer’s Gespenster am Toten Mann and Remarque’s “All Quiet on the Western Front”. Various images make references beyond the texts, pointing to the contrast between illusory world and reality. The title itself comes from a patriotic play of 1914.